This website explores the history, actors and elements involved in the controversy surrounding the protection of the grey wolf under the Endangered Species Act. This is a very contentious issue with many complex elements that are currently being debated by different groups of people through different means of communication, and represents an informative intersection of environmental science and policy. Grey wolves were once prevalent across the United States, but efforts to demonize the species resulted in its extirpation in many areas in the 1920s. 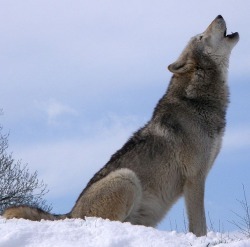 A movement to restore the grey wolf to its former range arose in the mid-1960s, which involved the listing of the wolf under the federal Endangered Species Act in 1967 and then the controversial reintroduction of the wolf to Yellowstone National Park in 1995, and wolf populations began to grow. However, some individuals and organizations took issue with the protection of the wolf, contending that wolves damage livestock and crops and are a danger to the communities around their territories. In recent years, the wolf has been delisted from the Endangered Species Act and wolf hunting was declared legal in specific states and regions. This infuriated proponents of wildlife conservation, who argue that wolf populations require protection in order to remain stable. Today, the debate rages over whether the wolf should be protected by federal law or hunted to achieve the population control that is desired by some. -Debates Around Controversy: The different arguments involved in the controversy and the social worlds in which they are situated. -Contextual Elements: Critical objects or processes that are essential to the controversy and how different groups of actors relate to them. -Timeline of the Controversy: How the controversy began and progressed up to present day. -Multiform Documentation: The key ways in which the controversy is communicated. -Actors: The critical individuals and groups involved in the controversy and their influences in shaping it. -Pivotal Literature: Academic articles that have been significant in the development of the controversy and clusters of research that have instrumentally impacted the controversy. -Actor Network Analysis: The organizations that have been involved in the controversy and how they are related.